First and foremost, I love weddings. I've told my husband many times that I wouldn't mind having another one myself, if it could be with him again! Luckily for me, I am blessed with many Brides who choose to share their journey with me. We will begin at the beginning, with you giving me all the juicy details about the proposal, the dress, the venue, and your vision for your day (preferably over an iced beverage at Starbucks). Fair warning: we are likely to become good friends in this process. Many brides don't realize that you actually need to schedule "photoshoots" during your wedding day! You want photos of yourself getting ready, the groom getting ready, a session with the bridesmaids, a session with the groom and groomsmen, and portraits after the ceremony. Perhaps you want a "first look" reveal session before the ceremony to save time. There has to be time built into your schedule to make this happen! But don't stress. After discussing your preferences and wishes, I will provide you with a professionally crafted photography timeline for your big day. You will find this to be SO helpful in making sure everyone is where they need to be, when they need to be there! Waiting 6 weeks to see your wedding photos is painful. 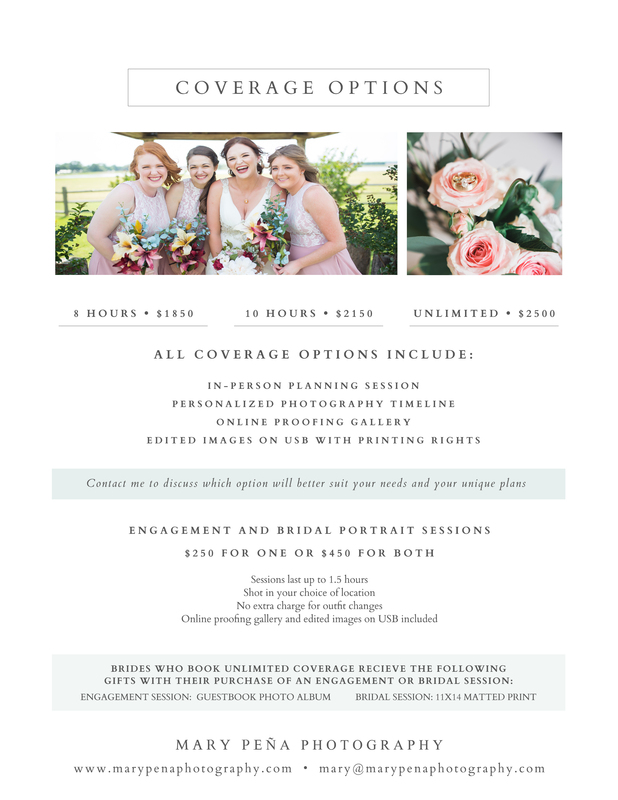 My brides enjoy a sneak peak blog post of their wedding within 2 days, and delivery of their full wedding day gallery within 10 days. Your photos will be waiting for you when you return from your honeymoon! All of your photos will be delivered to you on a custom USB drive. They will also be posted in an online proofing gallery that you can share with family and friends! The value of this experience begins at $1850. To see full pricing details, kindly download my pricing guide by clicking here.